We love to have indoor plants and flower arrangements in our home. We used to have some indoor plants and flower arrangements as part of the decorations to enhance our wooden furniture in the living room and a pot of plant in the washroom. However, eversince we had our first daughter five years ago, we removed all of them to protect her from allergies problems caused by the plants and flowers in the house. By doing so it also save us time in maintaning those plants especially when I have my own baby to look after. But How to Get a Green Thumb? By using silk trees, flowers and plants would be the obsolute solution for going green, solve the allergies problem and save the environment at the same time. Believe it or not? The silk plants look exactly like real!! 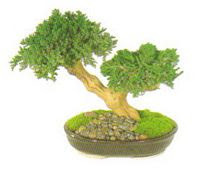 I particularly like this silk bonsai plant, it would be perfect for putting at the side table with my feng shui figurines, that would sure bring luck to our home. A silk bonsai plant, it looks really real..